MMS’s lower elementary program covers the traditional grades of first through third grade. At this level, experience and exploration are emphasized. As Montessori students learn by doing, the lower classrooms are rich in materials and resources. Students continue to develop practical life skills at this level, and take even more responsibility over their classroom environment. It is through experiences inside and beyond the classroom environment that students learn to appropriately interact with the people and the world around them. Students continue to utilize Montessori math materials in order to learn basic math facts. First-year students are introduced to the four arithmetic operations, as well as an introduction to fractions and monetary currency recognition. Second-year students focus a great deal on multiplication and division. Third-year students move into more abstract mathematical concepts, such as more advanced fraction and decimal work. In the lower elementary classroom, children learn to read naturally and “organically” as reading is integrated into every facet of the classroom. First-year students read and are read simple, repetitive books. Second and third-year students continue to develop their reading comprehension skills. The teacher will select some of the reading material, but students are also encouraged to read books that capture their interest. In order to assist students who struggle with reading even further, MMS does use a comprehensive reading program, The Herman Method, which is very effective for students who need additional exposure to reading. Montessori students learn to write in cursive. Students are expected to practice penmanship and are given a variety of activities to improve these skills. Students are introduced to basic grammatical concepts, and grammatical work increases in complexity as the students move through the three-year curriculum. History at Meadow is taught from the big picture to the small. The child begins with the study of the universe and ends up with the study of specific peoples and cultures. In the first year, history lessons teach the concept of time, moving from hours to years to centuries and beyond. In the second year, the child studies the Fundamental Needs of People throughout time. In the third year, the child begins the study of the universe — when and how life developed on earth. Students study biology-both botany and zoology-during their three years in the program. Classification, vocabulary, and identification are the primary scientific skills they learn during their scientific studies.Students use the Montessori map puzzles and other materials to learn about the continents and countries. Third-year students choose a continent and conduct an in-depth study of it, learning about the countries and capitals as well as the socio-cultural aspects of the countries. The Time Line of Life material synthesizes the child’s work in history, science, geography, mathematics, etc. It is a fine example of the integrated curriculum of the Montessori classroom. The early elementary curriculum expands the students’ understanding of the world by requiring students to study either Spanish or Chinese. Language classes meet four times a week and emphasize speaking skills. Students also have daily physical education classes and spend this time outdoors. They also receive instruction in art and, at MMS, music education is a major part of the student’s academic journey. First-year students are introduced to music through playing the recorder. Students can then choose to play the violin, viola, cello, or recorder. The second- and third-year students have instrumental music twice weekly and vocal music once per week. 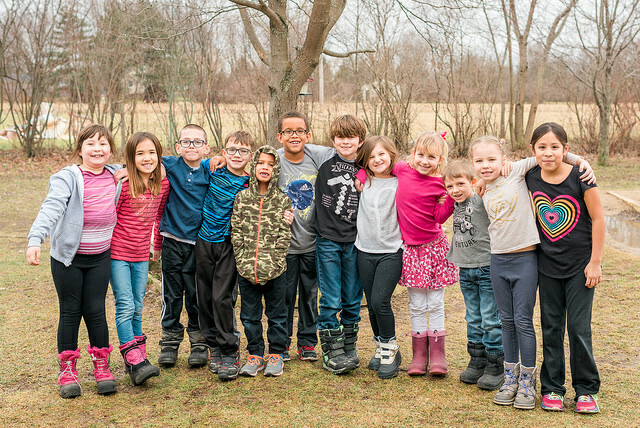 The lower elementary classroom provides the student with the necessary literacy and mathematical skills to move onto the upper-elementary program, where these foundations are further developed.